• aboard a safari boat with only 6 double cabins! Read more and ask for our price! 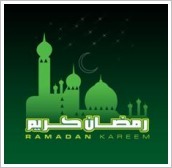 Tomorrow, Ramadan (‏رمضان ‎ramadān), the holy month of fasting, the ninth month of the islamic moon calendar, will begin. It starts (every year about 11 days earlier) as soon as the new crescent moon can be sighted with the naked eye and lasts for 29 or 30 days until the sighting of the next crescent moon. Fasting during Ramadan is one of the 5 pillars of Islam and obligatory for every healthy adult moslem. Fasting means, every day from dawn to sunset, to be abstinent from food, drinks, smoking, and sexual activity, and to put more effort into spiritual reflection and worship. 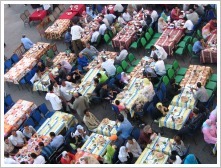 At sunset, the families gather the fast-breaking meal known as Iftar. The meal starts with the eating of three dates or drinking water and an invocation prayer. Afterwards follows the evening prayer. Not before all that, everybody enjoys the main meal, preferably with family and friends. At the end of the dinner one third of one's stomache should be filled with food, one third with liquid, and one third should be left in blank. If you travel to Egypt this August, nobody will exspect from you to fast also, but show your respect by going without food, drinks, and cigarettes outside of restaurants and hotels, and by taking heed of your clothing. By the way, Egypt is famous for its Ramadan lanterns (fanous). Homes and streets are beautifully decorated with them. We wish all those who fast "Ramadan Kareem"! While throughout Europe and America bookshops close their doors and printed newspapers stop to be published Egypt is experiencing a contrary trend: New bookshops, publishers and newspapers pop up. Chain bookstores open new branches. Independent bookshops with arabic literature, English books, children's books and comics start, book fairs invite potential customers. The revolution has created not only many internet users but also new readers and writers. Egypt, a country with 50% illiteracy rate up to now, will reach 90 percent literacy within a generation, analysts predict - a huge market. 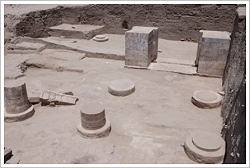 Last week archaeologists unearthed two major monuments at Karnak Temple. The first was the wall that once enclosed the small Temple of Ptah located at the northern border of the large precinct of Amun-Re at Karnak (as seen from entrance: on the left exterior in line with the 4th pylon). 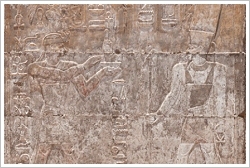 They also found a number of engraved blocks from the Ptah Temple dating back to the reign of Pharaoh Thutmose III (18th dynasty, 1458 – 1426 BC). The restorers are now carrying out comprehensive work to reconstruct the temple and open it to the public next year. 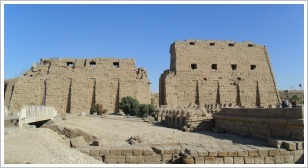 The second was a gate dated to the reign of Nubian Pharaoh Shabaka (25th dynasty, 716 - 707 BC). 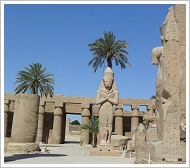 He restored the 4th pylon at the Karnak Temple and decorated the Ptah Temple. The gate that once closed up the Pharaoh's treasury hall is very well preserved. Ever wonder: "I have read here something about this subject recently, but when?" Indeed, we cross-reference current news to back news but not vice versa. 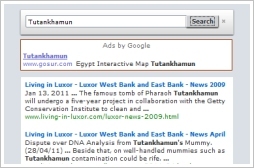 In order to offer you more service we have integrated a customised google search engine now whereby you can search all Living in Luxor News Pages for keywords. 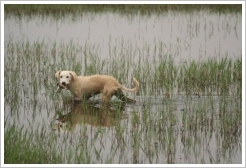 Sorry to say that we have to accept therefor sponsored ads but we think the service it's worth it. Or what do you say? Try it. On every page of our website (by now we have 65) you find the item "News" on the right menu. First click on it and then on the last subitem "News Search". Or do it right here. *When you mouse over a picture you will get information about it. Unless otherwise specified copyright reserved by Living in Luxor.